Robert King Jr., Executive Director of the Jockeys' Benefit Association of Canada (JBAC), recently notified the JBAC Directors of his intention to retire from the position, on April 20, 2019. Established in 1947, the JBAC is the collective association for professional Thoroughbred Jockeys across Canada. In response, Director Larry Attard, paid tribute to Mr. King; a former Champion Jockey and Stakes-winning Trainer, who utilized his expertise and intimate knowledge of the industry, to demonstrate outstanding commitment to improving the lives of Canada's Jockeys. King, a veteran of the Thoroughbred industry, has almost 40 years of experience in racing. He rocketed to the top of the standings as an Apprentice Jockey, winning back to back Sovereign Awards as leading apprentice in both 1983 and 1984. King was part of a winning “World Team”, consisting of such International greats Jockeys, such as Steve Cauthen, Pat Eddery and Willie Carson, competing against South Africa, in South Africa. His international success continued in 1987-88, with a year riding stint, in Hong Kong. 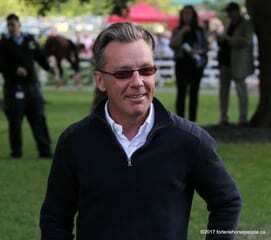 A successful stint as a Stakes-winning Trainer in the late 1990's led him to the winner's circle on the ground, but the allure of the saddle drew him back to riding in the mid 2000's. In both 2006, and 2007, King reigned in Fort Erie as back to back champion jockey highlighting his success with a six win day, a feat not achieved since 1977. In 2008 he hung up his tack to take over the reins of JBAC, to help his fellow jockeys navigate new rules, increase safety protocols and negotiate better insurance coverage. His depth of experience and passion for the thoroughbred has shone throughout his career and led to his winning of the Avelino Gomez Award in 2009 for outstanding contribution to the sport. This entry was posted in People and tagged canada, canadian jockeys, Horse Racing, jbac, jockey, Jockeys, jockeys' benefit association of canada, larry attard, Robert King, trainer by Press Release. Bookmark the permalink.